Rivalries are inevitable. Any time money and ego are at stake, strong and unchecked emotions often find their way into the equation. Technically speaking, those involved in a rivalry don’t have to dislike each other. But, as we’ve seen with the Hatfields and McCoys, Los Angeles Lakers and Boston Celtics, and Angelle Seeling and Matt Hines, it certainly makes things more interesting. In some respects drag racing may be more conducive to rivalries than other sports. Because the races are so short and the “conflict” resolved so quickly, a sort of compressed reality is in effect. A baseball game may last for three hours; a drag race may last for seven seconds—making the competition tougher on nerves and friendships. There is another factor at work, and it is one that has found its way into all motor sports. 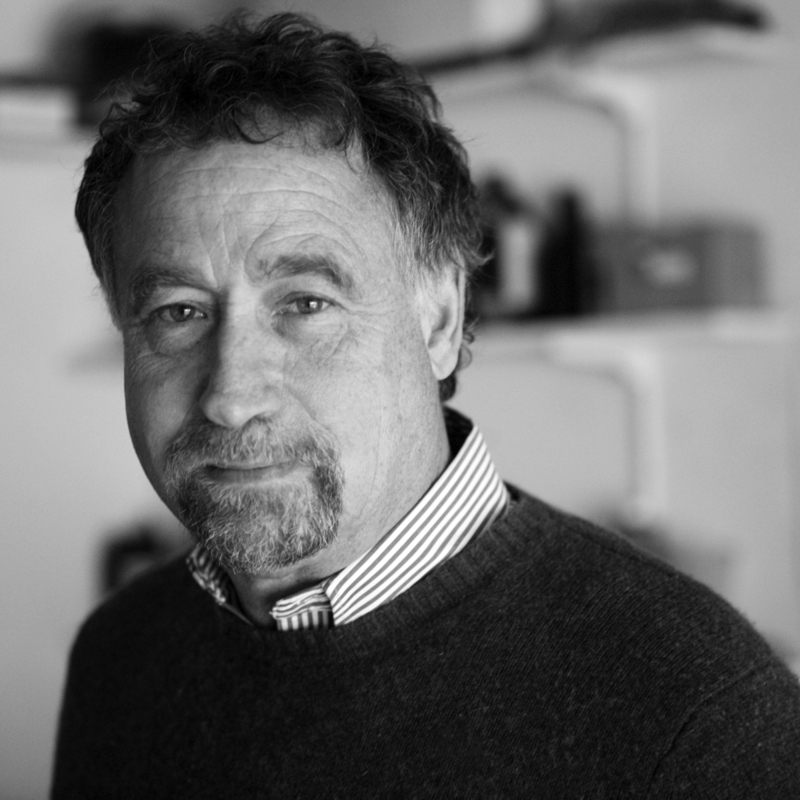 Some teams feel they are not competing on a level playing field, that certain teams competing with certain brands of machine have an advantage—not just because the machines are quicker but because the manufacturer is in a position to exert more influence on sanctioning bodies, which skews the game. It’s not a new argument and there are many opinions as to whether it is a valid one. Most often, rivalries are between brands. You can be a Harley-Davidson guy or Suzuki guy or Victory guy but you can’t be more than one at the same time. It doesn’t work that way. 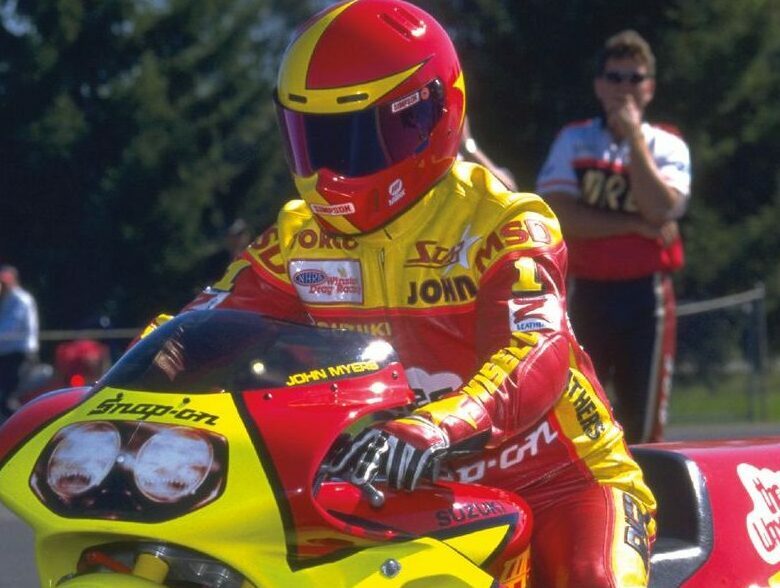 Sometimes, though, the rivalry isn’t between brands of motorcycle or even between “peripheral” brands such as oils, but between brands of products having nothing to do with the sport. 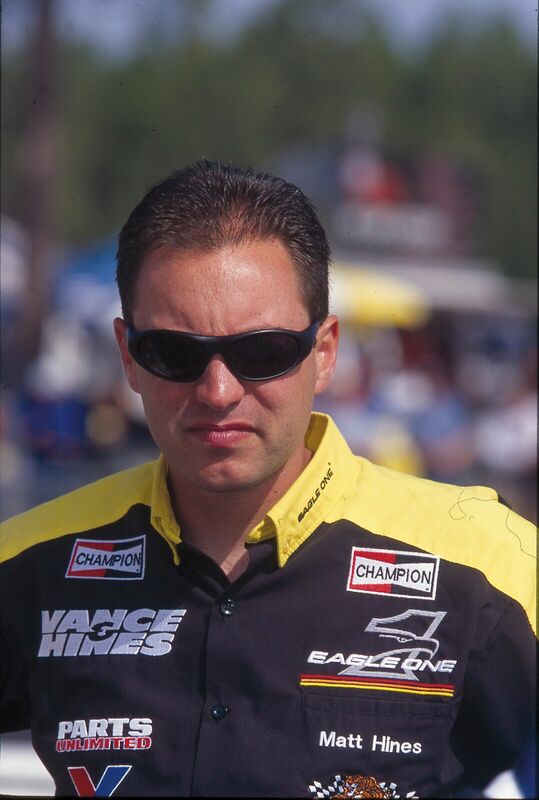 And those rivalries are especially heated when the sponsors are in the same business, as in the long-time rivalry between Budweiser and Miller in Top Fuel. Even though neither product improved the machines’ performance, the association was enough. Both made beer and both wanted theirs to be associated with winning. 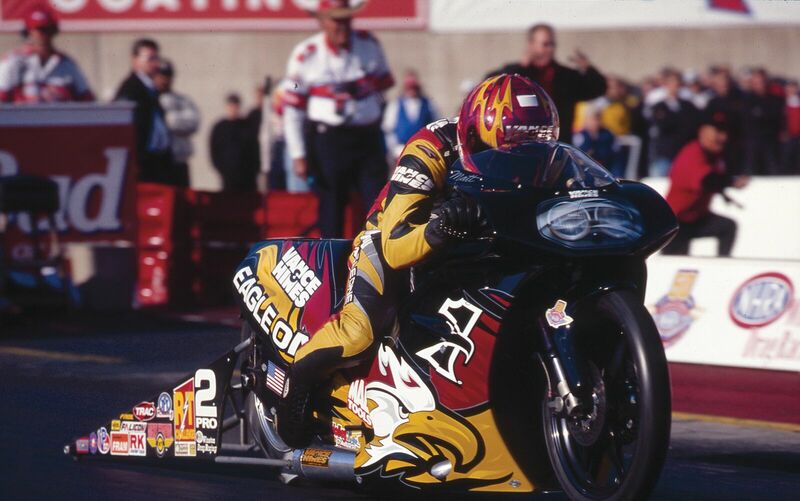 In the early Nineties there was a tremendous rivalry between Pro Stock bikes sponsored by Eagle One and the Wax Shop. It made sense: Both made car care products and both wanted theirs to be displayed on the sides of the winning motorcycle. 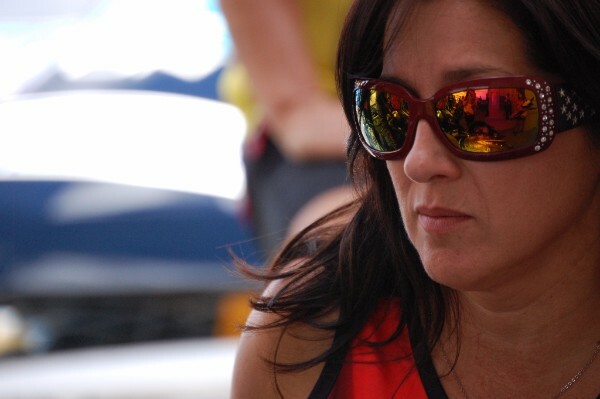 When Angelle Sampey started racing professionally in 1996, it was she against “the guys”. In time and as the lines were drawn, it became her against a few guys in particular. It doesn’t matter what the sport is, the men versus women rivalry is constant and guaranteed and will probably always be. As time went on the male versus female rivalry lessened considerably. 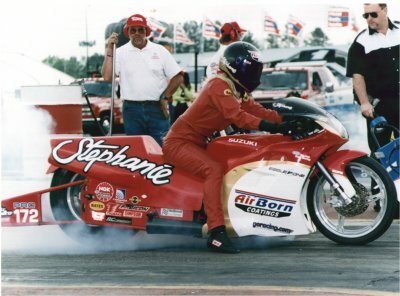 Sampey won three NHRA Pro Stock Bike championships and doubters soon became believers—just as they did when Karen Stoffer, Stephanie Reaves, Peggy Llewellyn, Angie Smith, and Connie Cohen became racers—and increasingly winners. They weren’t the first. 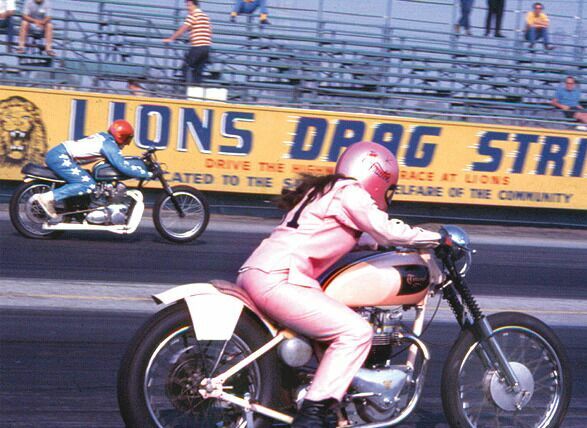 In the late 1960s Southern Californian Joy Houston rode a Triumph 650 prepared by her husband, Art. Bebe Fox of Houma, Louisiana, held the national H/Stock record on a Honda 175 tuned by husband, Al. 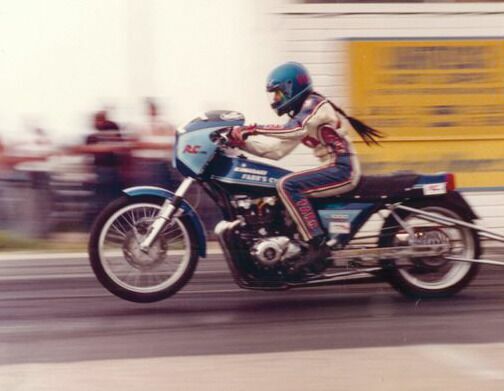 And Vicki Farr of Tulsa on a Kawasaki tuned by husband Marshall won the IDBA World Finals in 1981, becoming the first woman to win a Pro Motorcycle Drag Eliminator at a National event. Vicki Farr not only won a number of races, she also left quite an impression because of her riding style. As husband and tuner Marshall Farr recalls, “Vicki would stage the bike, put both feet on the pegs, and stay perfectly balanced before the light came down. Clutch released, and I knew it was a good launch when her pony tail stuck straight out. Not surprisingly, women had made their presence felt in automobile drag racing several years earlier. In 1964, Barbara Hamilton became the first female to receive an NHRA license. 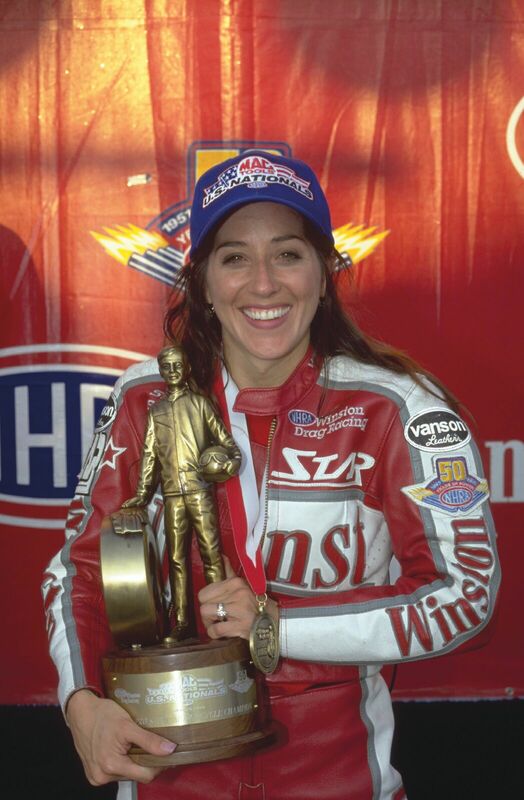 Two years later, Shirley Shahan became the first to win an NHRA national event. 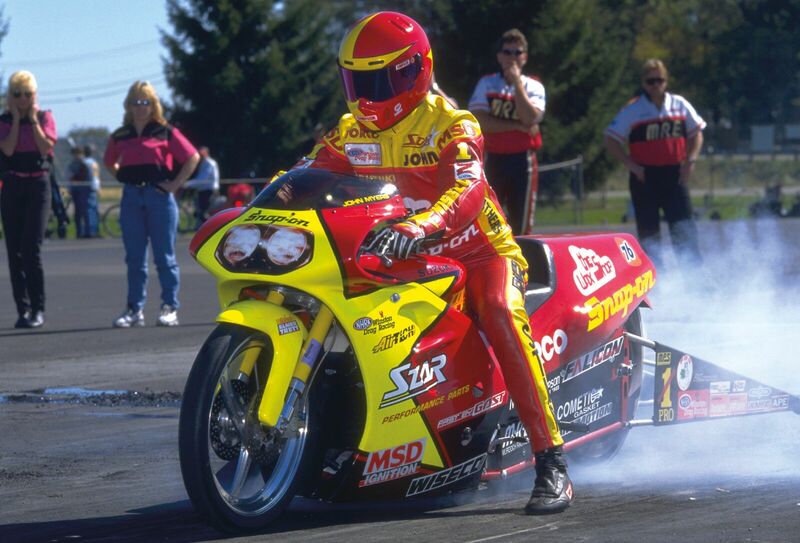 But it was at the NHRA Mile-High Nationals in 1996 that women’s presence in motorcycle drag racing would be established. Stephanie Reaves, Karen Stoffer, and Angelle (at the time) Seeling made their professional debuts and each of them qualified. When women were involved in the earlier years of the sport, it was generally in more of a supportive role. In time that changed and women like Jackie Hill , Jackie Trett. Carolyn Thronson. Kathy Owens, Phyllis McClure and Meredith Schultz—were very much part of the team. 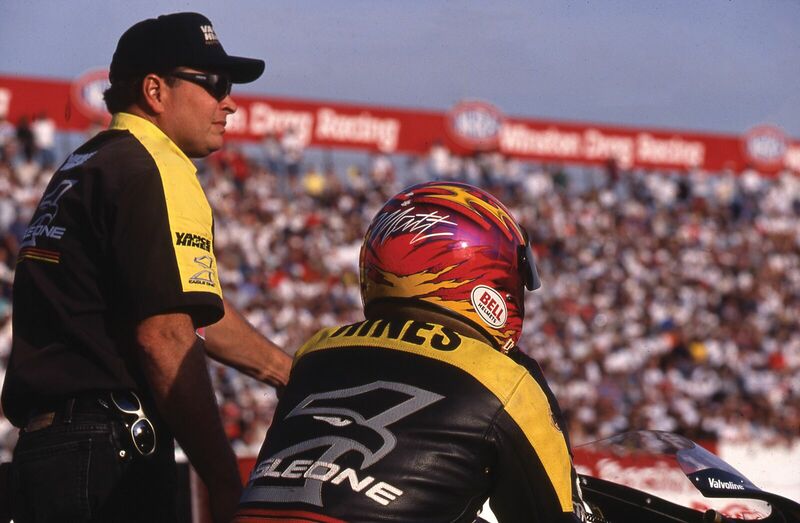 Stephanie Reaves was the first woman to receive an NHRA Pro Stock Bike license and first to qualify at a NHRA national event. 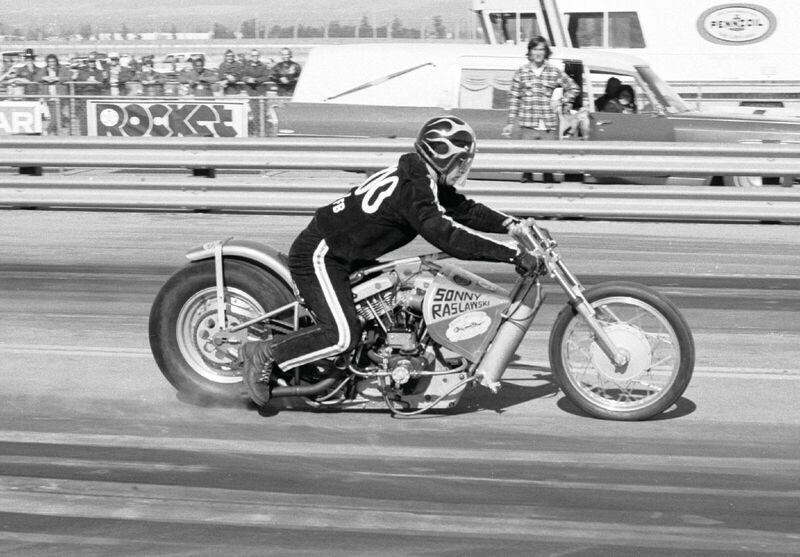 Unlike some professional sports where rivalries are created for the purpose of increasing ratings, certain rivalries in motorcycle drag racing weren’t based on anything as calculating or manipulative. The participants simply didn’t like each other. The rivalry between Angelle Seeling and Matt Hines in the mid- to late-Nineties had to happen. Too many of the prerequisites were met for it not to. “It’s a real rivalry,” Hines said at the time. “It’s not some fake WWF thing. It’s legitimate. It’s Dale Earnhardt versus the world. It’s Angelle versus the guys.” But in that Matt Hines was the best of the guys, it was likely that he would become her greatest rival—which he did. Seeling, not surprisingly, saw it differently. During the previous two seasons, Hines had won 13 races and she suggested that the fans simply wanted a different face in the Winner’s Circle. 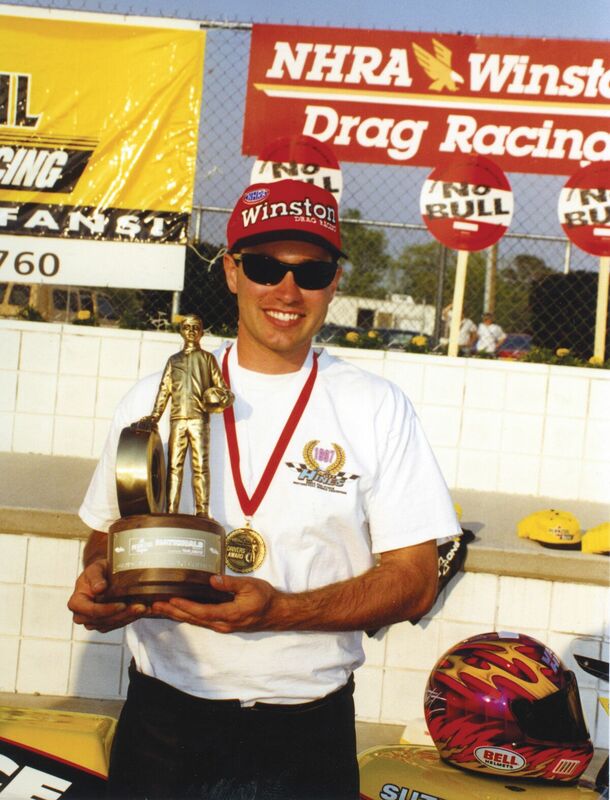 It probably didn’t help that when Matt Hines won his third consecutive title in 1999, he did so by defeating Seeling in the final two races of the season. It also didn’t help that his margin of victory was just eight points. Because Hines and Seeling entered the sport at the same time and were equally dominant they were continually compared with one another. The ingredients for a rivalry were there for another reason. 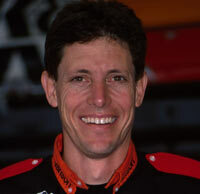 Myers was sponsored by Star Racing and Schultz’ machine used an engine prepared by Vance and Hines (before he teamed with Greg Cope). 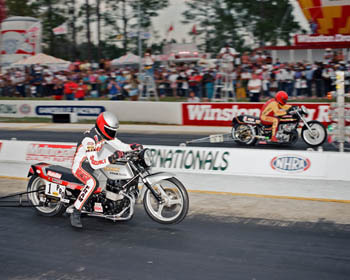 The rivalries between Hines and Seeling and Myers and Schultz, while significant, were but part of a larger rivalry between Star Racing (and later including G-Squared) and Vance and Hines Racing. It was inevitable. For one thing the teams were closely matched. One team would win one year; the other would win the next. Each team had its share of strong and gifted personalities. And importantly, each was a premier manufacturer of racing machines and equipment. A victory therefore not only benefited them emotionally but financially. It was a “Battle of Businesses” as much as it was personalities. 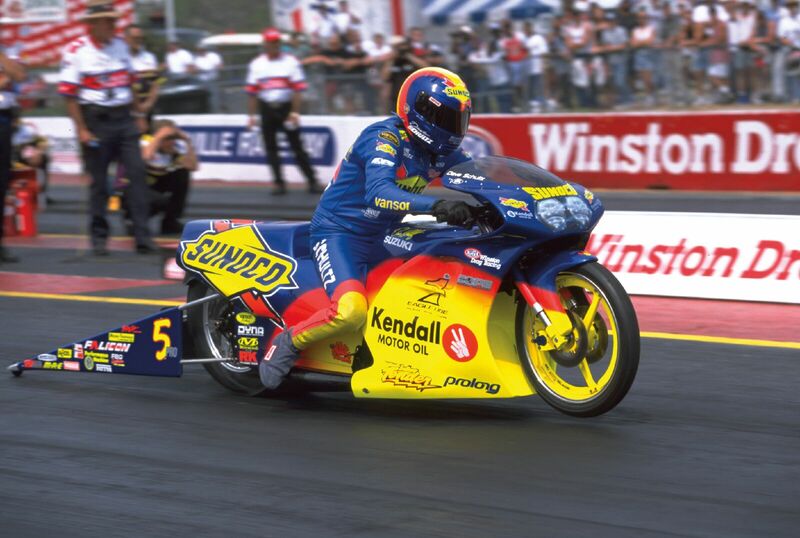 The Star Racing team of riders John Myers and Angelle Seeling, and the Sunoco Racing team of Dave Schultz and Stephanie Reaves. There was a lot of talent and inevitably, a lot of emotion. Incredibly, Matt Hines was the only rider in the Nineties other than John Myers and Dave Schultz to win more than one national event. And then, there are the inevitable geographic rivalries, as in East Coast versus West Coast. 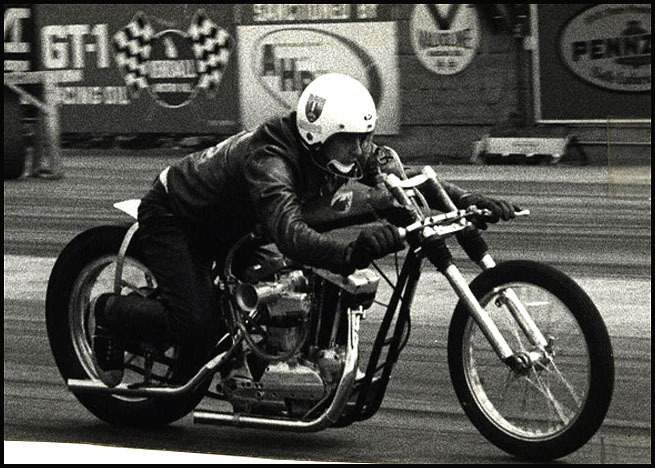 It happened in music, it happened with in football, and in the late Sixties, it happened in Top Fuel Motorcycle. The East-West rivalry was very real in the late Sixties, and Californian Sonny Raslawski was right in the middle of it.